I first had this Persian rice dish at the Orchard Market and Cafe in Towson Maryland about 14 years ago and I've had it many times since. They describe their Shirin Polo this way; "a colorful presentation of bone-in poached chicken in an orange-mango-saffron sauce. 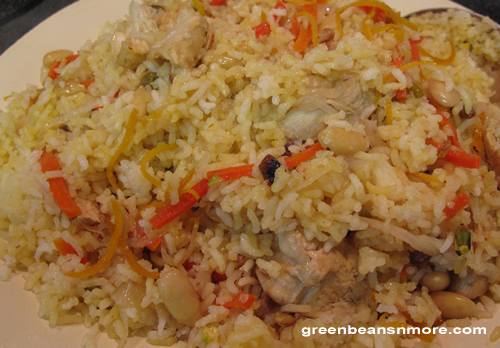 Basmati rice with carrots, currants, raisins, and nuts." So, naturally when I was looking to recreate this sweet rice dish at home I wanted a very similar recipe. I have to give a nod to several different sources for this recipe. First is worldwidegourmet.com for the recipe (which I used almost verbatim except for a change or two), second is Najmieh Batmanglij, third is Nesta Ramazini. Batmanglij and Ramazini are both Persian cookbook authors whose techniques I incorporated in the preparation of the recipe, the preparation of the rice, and for the cooking the dish. This is a time consuming dish to prepare from start to finish, but I was very pleased with the overall results. Peel the orange skin in long strips, do not include the pith. Slice into thin strips. Place the orange zest in a small saucepan. Cover with water and bring to a boil. Remove from the heat, rinse under cold water and drain. Melt the butter in a saucepan. Add the carrots and cook for 10 minutes or until the carrots are tender. Place 1 or 2 tablespoons of the sugar and the saffron in a mortal and pestle. Crush together into an orange powder. Dissolve the saffron powder in a glass with 2 tablespoons very hot water. Add the orange zest, almonds, sugar and saffron to the carrots. Cover and cook over low heat for 20 minutes. Add the pistachios and cook 5 minutes longer. Peel and thinly slice onions. Fry in oil until slightly golden. Remove onions and drain on paper towel. Add chicken to the same pan and brown on both sides. Remove the chicken and pour off the fat and return the chicken to the pan. Season the chicken with salt; arrange the onions on top; pour the water over and bring to a boil over high heat. Cover and reduce the heat and simmer for 20 - 30 minutes or until the chicken is cooked and tender. Remove the chicken and onions to a dish. Save 1/2 cup of cooking liquid. While the chicken is cooking, cook the rice according to the traditional Iranian method - see below. Add a small amount of oil and hot water to 1/3 of rice, then spread the rice evenly over the bottom of a heavy pot. As you add the remaining ingredients pile them into a pyramid shape to allow the rice to expand. Layer 1/2 chicken pieces over the bottom layer of rice, then layer 1/2 of the orange carrot mix. Add another layer of 1/3 rice, then layer rest of chicken and orange carrot mix. Cover with remaining rice. Pour the reserved chicken juice over the rice. Place a kitchen towel over the top of pot to prevent steam from escaping. Place pot in a 350 degree oven for 30-40 minutes. Rinse the rice 4-6 times, swirling rice with fingers until the water becomes clear. Then soak rice in fresh warm water for 3-4 hours. Drain. Place 6-8 cups of water in a large pot and bring to boil. Add the rice slowly, stirring so you don't break the boil. Boil rice briskly for 6 minutes stirring occasionally. Rinse the rice under cold water and drain well.